60-unit luxury apartment community located steps from booming Quincy Center. Developed by Boston Property Ventures (BPV), Hillside features unique, desirable amenities including a state-of-the-art gym, a spacious roof deck, private balconies, a billiard/recreational room and a sweeping green lawn shared with BPV’s adjacent Brookside at 999 Hancock luxury condominiums. 83 garage parking spaces are provided at Triple 9 Hillside. Apartments are now available for lease. Hillside is located convenient to the shops and restaurants of Quincy Center, as well as the MBTA Red Line and the childhood home of former United States Presidents John Adams and John Quincy Adams. Interior Finishing is ongoing for the new luxury apartment community, Triple 9 Hillside, just outside Quincy Center. The 60 unit property will feature a fitness center, roof deck, and rec room. There is also parking for 83 cars in the garage at the property. Pre-leasing has started with expected completion in the coming months. 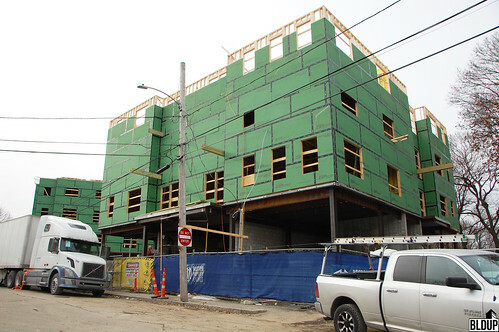 With an anticipated opening this fall, work is ongoing at Triple 9 Hillside, in Quincy. This 60-unit luxury apartment community will feature a fitness center, roof deck, and ample outdoor space. 83 garage parking spaces are also available for resident use. The project is located just minutes from Quincy Center with easy access to shops, restaurants and the MBTA. Triple 9 Hillside, phase 2 of the Hillside development project by Boston Property Ventures, will begin leasing this spring (2018). The finished building will consist of 60 rental units over five stories, a two-floor parking garage underneath with 83 parking spots (a ratio of 1.4 per unit), 65,800 sf of living area which include the same high-end amenities provided in adjacent Brookside at 999 Hancock (state-of-the-art gym, spacious roof deck, private balconies and a billiard/recreational room). Construction is currently projected to be completed by July 2018 in order to hit the premium lease-up date of September 1. Boston Property Ventures (BPV)’s upcoming Hillside luxury apartments, located in Quincy Center, are about to top off at five stories tall. Just one floor remains to be added to the building’s structural frame, which has been sheathed with moisture-resistant cladding. The building’s steel base podium is complete, with a concrete slab poured on top; upper floors are being framed with wood. Within completed floors, residences and common spaces are being framed with internal wood and metal stud framing. Windows have been delivered on site and have begun to be installed in order to seal the building. In the coming weeks, exterior finish panels and interior finishes will be installed throughout the building.